Taste Carolina: Hillsborough – Voila! 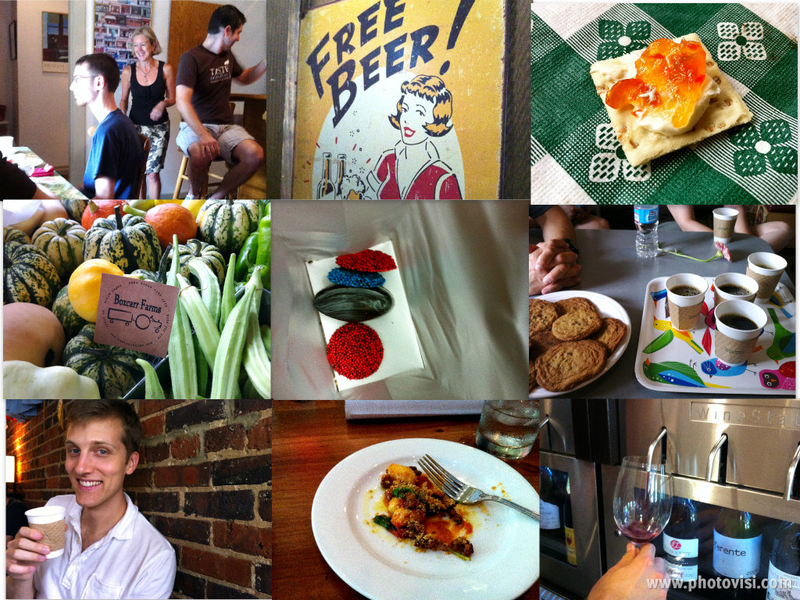 Taste Carolina offers culinary walking tours of several cities throughout North Carolina. For my birthday this year, James booked a tour through Hillsborough. It’s a small Revolutionary War-era town just north of Durham. In recent years it’s become a culinary destination with locally-sourced restaurants, coffee shops; plus bookstores, artist studios and general stores. We spent three-hours tasting Hillsborough’s best. Here’s the rundown! Colleen from Saratoga Grill chatted with us and served her Aunt Nancy’s chicken salad, her sister’s scone and great coffee. The Wooden Nickel served up pork, potato wedges and Blackberry Honey Kolsch beer. I even drank it – and that’s saying something. A visit to the Farmer’s Market! We met Two Chicks Farms who makes amazing pepper jelly and Boxcarr Farms who served refreshing lavender iced tea. Next we visited Matthew’s Chocolates. It’s worth the drive back just for the Hot Cocoa Truffle. Then a stop at Cup-a-Joe. Delicious salted chocolate chip cookies and coffee. This is a rare photo of James, a.) drinking coffee and, b.) enjoying it! I drank beer and he drank coffee – what’s happening?! Our favorite stop on the tour: Panciuto. This restaurant is 90% locally sourced. The menu lists where every ingredient comes from in the area. This is a potato gnocchi with homemade goat sausage, tomatoes and spinach. Out of this world. The owner and chef, Aaron Vandemark was recently nominated as semifinalist for a James Beard Award. He also spoke candidly with us about the challenges of owning a restaurant. We ended the day at the Hillsborough Wine Company. What better way to end the day than with a 3:00 happy hour? They also offer tours for those who are vegetarian, vegan, gluten-free, kosher or have any other dietary restrictions. After the tour ended we then took our time walking around the shops and galleries of Hillsborough. Definitely check out: Purple Crow Books, Eno Gallery and Ayr Mount House. What a fun birthday outing!! Great idea James!